Captain Mike DeRego of Maggie Joe Sport Fishing will be featured in an interview with Jody Leong with KITV4. The interview will air tonight, Wednesday 8/31/11, at 5 pm or 6 pm! Jody Leong with KITV4 on the Maggie Joe! Posted in Gallery, News | Comments Off on Captain Mike’s gone Hollywood! Angler Eric with Captain Mike, Mate Mark, Mate Tony and 357 lb Blue Marlin! Angler Eric with 357 lb Blue Marlin! 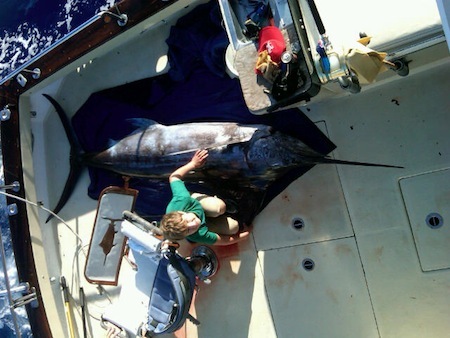 Eric on Maggie Joe deck with his Blue Marlin! 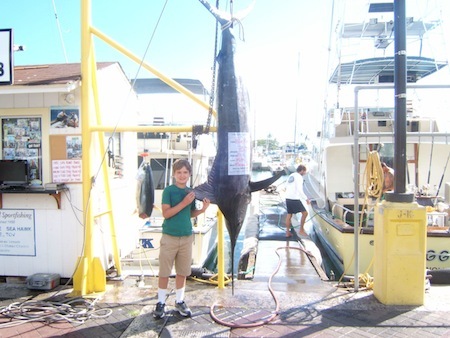 Mahalo to father, Laird, and son and angler, Eric, for choosing Maggie Joe Sport Fishing! The father-son team departed Kewalo Basin, next to Waikiki, aboard the Maggie Joe with Captain Mike and the crew on a full day sport fishing charter. 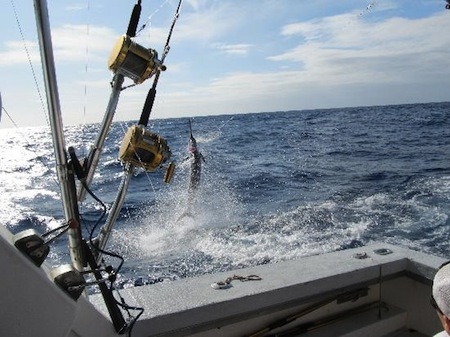 It didn’t take long for the action to start up as at about 7:30 am the team got their first strike of the day while deep sea fishing outside of Honolulu, Oahu… Eric hopped in the fighting chair and reeled in this 357 lb Blue Marlin in roughly 10 minutes! The guys got another double Ahi strike later on in the day, with one coming off and the second being bit by a shark… you can see the remains to the left of Eric in the photo above. What was left of the tuna made for great sashimi and steaks the next day! Aloha and we can’t wait to see you guys again on the water! 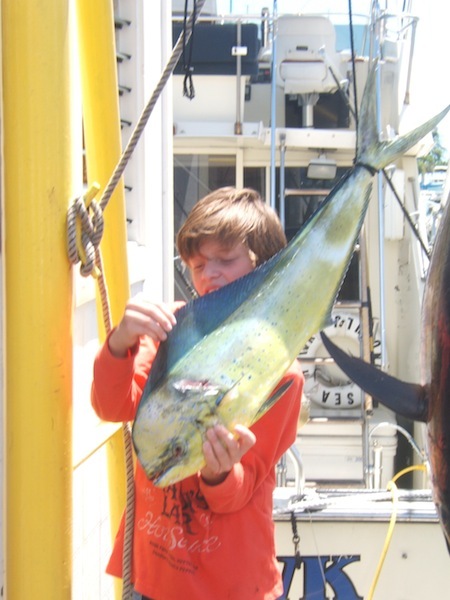 Eric posing with his Mahi Mahi! Eric with two 40 lb Shibi's and 1 Mahi Mahi! 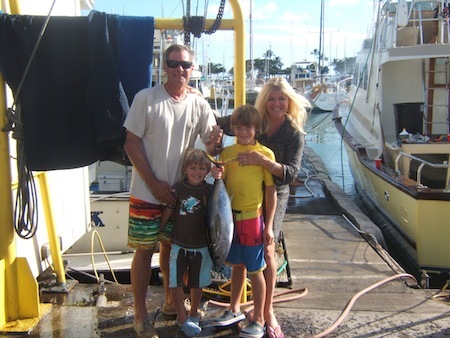 Mahalo to the Brunesson’s, the Sokolov’s and the Alexander’s for choosing Maggie Joe Sport Fishing! The group departed Kewalo Basin, next to Waikiki, aboard the Sea Hawk with Captain Morgan on a half day sport fishing charter. They spent roughly four hours deep sea fishing outside of Honolulu, Oahu and were able to haul in 2 Shibi’s and 1 Mahi Mahi! Great job and Aloha! Cool new video on taken on the Maggie Joe while deep sea fishing outside of Honolulu, Oahu for big Blue Marlin! 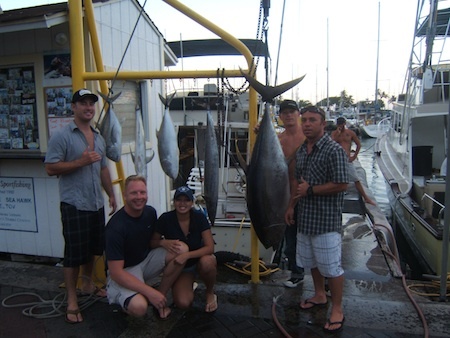 Kevin, Kristen and Jason with a handful of Shibi's and an Ahi! 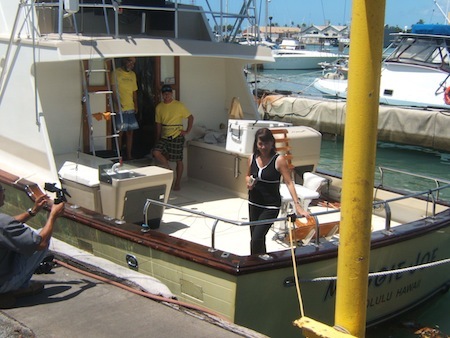 Mahalo to Kevin, Kristen and Jason for choosing Maggie Joe Sport Fishing! The group spent the day with Captain Matt aboard the Ruckus on a sport fishing charter. 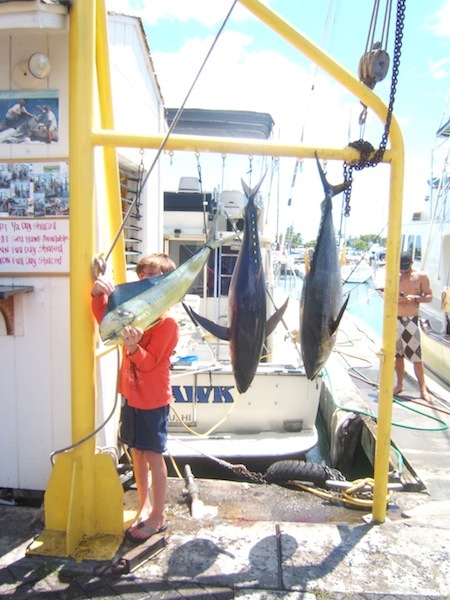 While deep sea fishing outside of Waikiki, Oahu Captain Matt was able to find a handful of Yellowfin Tuna. Kevin, Kristen and Jason were able to go home with some very good eating fish after reeling them in all day. Aloha! $20 off a pair of full day shared charters on 8/23/11! Call in and reference the website discount for pricing. 808-591-8888. Posted in News, Promotions | Comments Off on Maggie Joe Discounts! The Wallace's, Ryan, and The Susco's with 1 Ahi, 3 Ulua and 1 Ono! 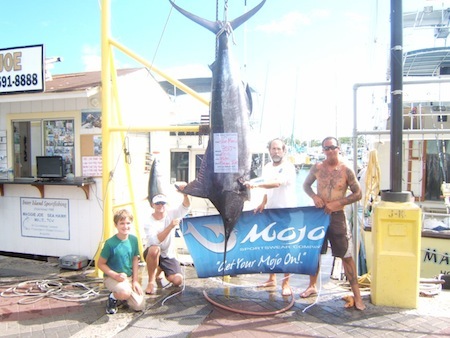 Mahalo to The Wallace’s, The Susco’s and Ryan for choosing Maggie Joe Sport Fishing. 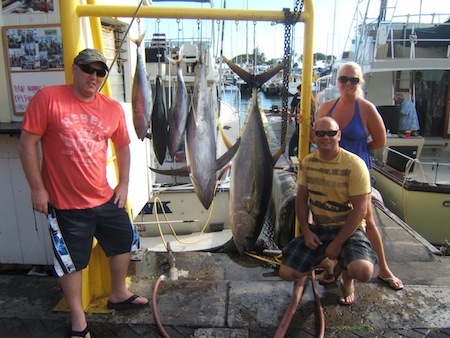 The group joined Captain Matt and Mate Tony aboard the Ruckus for a full day sport fishing charter on 8/21/11! Captain Matt did a great job finding the fish as they were able to land 1 Ahi, 3 Ulua and 1 Ono while deep sea fishing outside of Honolulu, Oahu! Thanks for the great time, everyone and we hope to see you out on the water again! Aloha! We’ve got some great Sport Fishing Tournaments coming up here in Hawaii! If you’re interested in chartering the Maggie Joe for a tournament please give us a call at 1-877-806-3474 or use our Contact Page. Posted in Fishing Tournament Schedule and Results, News | Comments Off on Upcoming Tournaments!